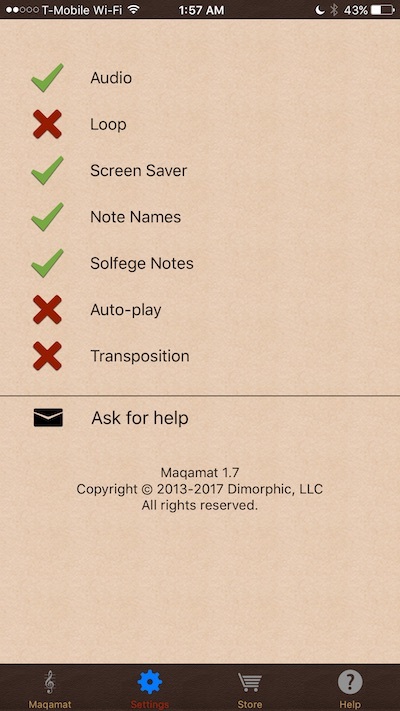 Maqam is a simple reference app. 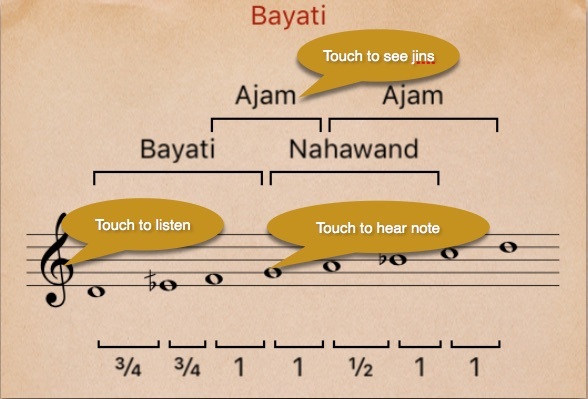 Select the Maqam from the list to see the notes and the ajnas. If auto-play is on, the maqam will play automatically upon selection. At any time, you can listen to the Maqam by touching the treble clef. Touch the “jins” name to jump to the Maqam corresponding to the “jins”. The sound can be muted in the settings. The numbered brackets indicate the intervals between the notes of the Maqam. To go back to the Maqam list swipe sideways on the screen. Turn audio on and off. Turn looping on and off. When loop is on, the Maqam will playback repeatedly until you stop it. When turned on, the screen will not sleep. Display the note names below the intervals. When on, the note names will be displayed as DoReMi instead of ABC. When on, the Maqam will start playing as soon as it’s selected. When on, a transpose slider will be visible on one side of the Maqam screen and you will be able to transpose the Maqam up and down by quarter-steps. Send mail to support requesting help with the app. indicates a premium option that can be unlocked by purchasing the “Premium” upgrade.